Detailed review of Nivea Soft Moisturizing Creme. See what real experts and actual users have to say about this moisturizer. Nivea Soft Moisturizing Crème is an average moisturizer. After trying it on my face, hands, and body, I found I really like the results on my hands and body. My face didn’t see as great of results. I think this crème is too heavy to be continually used on my face. It caused me to break out and also didn’t keep my oily skin at bay. However, my hands and body felt very soft and moisturized. This one is very cheap compared to most moisturizers, so if you’re in a bind and need a facial moisturizer, it won’t hurt to try it out. But overall, for my skin, I found it to be an average moisturizer. So I ranked it 2.5 out of 5 stars. Nivea Soft Moisturizing Crème is a thick, white lotion. It feels very emollient and hydrating to the touch. It’s very easy to apply this crème. You can apply to your face, body, and hands both morning and night, or really as often as you’d like to. The white crème is easy to blend in, and it doesn’t leave any white cast on your skin, which is nice. I could see this jar not lasting very long. It comes in a big jar, which I don’t think is the most sanitary, but most moisturizers come in jars these days. Good thing the jar is a nice size, because I used quite a bit on my body and hands. I’m surprised by how quickly this moisturizer dries. Once applied to my skin, it dried in under 2 minutes. I love the drying time, because I didn’t feel sticky or greasy immediately after application and I didn’t need to wait long to apply my makeup. I’m not a fan of the way Nivea Soft Moisturizing Crème smells. It’s not the absolute worst smell, but to me it resembles baby powder or an old lady smell. I can’t really describe it any better than that. It’s not a light, refreshing scent; it’s a heavy scent. The smell doesn’t dissipate either; it stays with you for a long time. Since this lotion can be used all over your body, I used it everywhere… on my face, hands, and body. After I applied it, I noticed my hands and face felt especially smooth. I applied my makeup on top of this crème, and to be honest, I didn’t love the results. My makeup looked and felt a little greasy after a few hours. As far as long term results, I love the results I saw in my hands and my body. However, I wasn’t as impressed in the results it had on my face. I noticed some acne breakouts on my chin after using this crème for a while. I also noticed that after a few hours my face would look oily, so it didn’t do a very good job keeping my oil at bay. But for those of your with extremely dry facial skin, you may like the results more than I did. I did however see great results in my hands and body while using this moisturizer. My hands are chronically dry, and this lotion did a great job combatting my dryness. My hands looked and felt great! Same with my body skin, my skin felt hydrated and looked soft. I wish this moisturizer did the same for my facial skin, but I think it’s too heavy for continual use on my face. This moisturizer has a few good ingredients in it. For starters, it includes Jojoba Oil. Jojoba Oil resembles wax or the sebum your skin produces, which can help condition your skin. For me, I think it actually causes breakouts, but I know many people benefit from this ingredient as it really helps lock in moisture. Nivea Soft Moisturizing Crème also has Vitamin E in it. Vitamin E is known for helping prevent and heal scars. It also has antioxidant properties in it which help protect your skin from free radicals that cause aging. This is one of the cheapest moisturizers I’ve seen. It only costs $5.39 per jar, you can’t beat that price. You can’t purchase this product on the Nivea website, so you’ll need to buy elsewhere such as Target, Walmart, or Amazon. The guarantee just depends on where you purchase it. 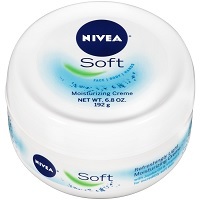 To buy Nivea Soft Moisturizing Creme, click here. Texture/Feel This is a thick, white crème. Application Applying is easy, you can use on your face, hands, and body. Drying Time It dries within 2 minutes. Smell Has a heavy, baby powder smell. Immediate Results My skin felt really soft, but makeup looked bad. Long Term Results It didn’t improve my face, but my hands and body looked and felt great. Guarantee Depends on where you purchase it. Price It’s very cheap, only $5.39 per jar.